The allies have landed on the shores of Echo Lake. With the help of state entomologists, nearly 15,000 Gallerucella beetles were released recently along the shoreline of this Union County park, which straddles the Westfield-Mountainside border. 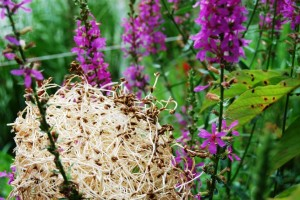 Their objective: purple loosestrife, an invasive plant that when unchecked, chokes out native plant species. On a recent Friday morning, Mark Mayer, supervising entomologist with the state Department of Agriculture’s Bureau of Biological Pest Control, met with county parks naturalists to release the beetles. And as soon as the little buggers warmed up—they are transported in chilled containers—they started swarming the leaves on the nearby loosestrife like they hadn’t eaten in weeks. 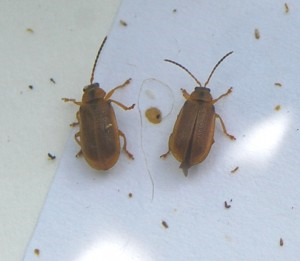 The Gallerucella beetles have been released in well over 100 areas in New Jersey. “Sussex County was really bad,” Mayer said, noting that conditions have improved there markedly. The beetle was released at Echo Lake Park several years ago, but the recent dredging project to clear the lake had the unintended consequence of reducing the beetle population, Mayer said. When the lake was lowered, it is likely that many of the beetles burrowed into the exposed soil to pupate. But when the next generation hatched, they would have drowned because the water level had risen in the interim. The recent release was to get the beetles back up to a level where they would keep the purple loosestrife in check. The loosestrife made its way to America in the 1800s. Ships that did not have full cargo holds would use soil for additional ballast to stabilize the boat. But when that space was needed for the return voyage, the dirt which would have had the loosestrife seeds, was dumped along the American shores. From there, it just started spreading inland, Mayer said. In the mid-90s a Cornell University professor Bernd Blossey was doing research in Germany when he discovered the Gallerucella beetle and its predilection for purple loosestrife, Mayer said. After extensive testing, the federal government approved using the beetle to control the plant and at a special state Department of Agriculture facility in West Trenton, one of only a handful in the country, the beetles are raised and then transported to areas around the state where the loosestrife has gotten out of control, Mayer said. The Union County Board of Freeholders approved dredging Echo Lake because years of silt accumulation had taken their toll, with islands being created because so much soil had settled in the upper lake. In addition to improving the water flow and deepening the lake, it also enabled the return of paddleboats which had been a favorite past-time at the facility. The paddleboat concession reopened last month. But it was after the dredging, however, the purple loosestrife started spreading again. So the county requested another application of the beetles, fearing that if the situation had gone unchecked, the loosestrife would have choked off the lake entirely. The Gallerucella beetle is not the first time Union County has been on the frontlines of the biological war to control invasive species. Two years ago, in the Watchung Reservation, tiny weevils imported from China, known as Rhinoncomimus latipes, were brought in to feed on Mile-a-minute weed. Mile-a-Minute Weed, Polygonum perfoliatum, can grow up to six inches per day, with mature plants reaching six feet, according to state plant experts, it can climb over, and shade out native plants at the edges of woods, along stream banks and roadsides. 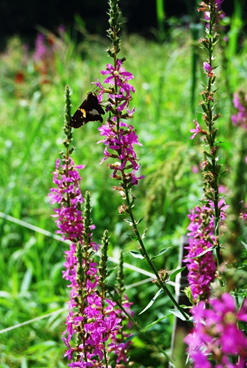 While extremely pretty, purple loosestrife is an invasive plant species that will choke out native plants. In order to bring the plant under control, state entomologists have released swarms of gallerucella beetles at more than 100 locations around the state. 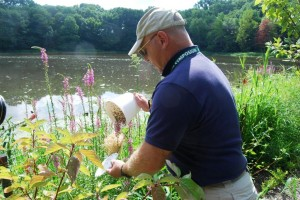 In order to control purple loosestrife, an invasive plant species that has been spreading at Union County’s Echo Lake Park on the Westfield-Mountainside border, Mark Mayer, supervising entomologist with the state Department of Agriculture’s Bureau of Biological Pest Control, released nearly 15,000 gallerucella beetles that will eat the plant and bring it under control. While gallerucella beetles are shipped to a site in chilled containers, as soon as they start to warm up, they start swarming the leaves on the nearby loosestrife. The gallerucella beetles have been released in well over 100 areas in New Jersey to control the purple loosestrife, an invasive plant that chokes out native species. As he mounted his all terrain quad, a tank of herbicide secured to the back, Eric Schrading prepared to do battle yet again in one of Union County’s parks. But after years of combating Japanese Knotweed and several other invasive plant species spreading throughout Lenape Park, he knows this war will never end. With his help, the county has gained the upper hand, but this is one war that will never be totally won, he said. It’s not just a matter of invasive species like Japanese Knotweed crowding out native plant species. The monoculture that results reduces the diversity of wildlife that depend on the variety of other species of plant life to survive, said Schrading, an assistant supervisor with the U.S. Fish and Wildlife Service. In 2001, the Union County Board of Freeholders agreed that the county would benefit from partnering with the Fish and Wildlife service, joining together on a project to protect nearly 20,000 native plants that were placed in a newly created wetlands park in Rahway. Four years ago, the county agreed to the program at Lenape Park, which straddles portions of Westfield, Cranford and Kenilworth. 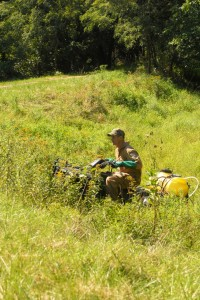 As part of the program, Fish and Wildlife would spray the herbicides for three to four years. The Board of Freeholders, for its part, committed the county to continue planting native species supplied by Fish and Wildlife and maintain the targeted areas for at least 10 years. There are similar programs scattered around the state, although the worst problems with Japanese Knotweed are in Union and Essex counties, Schrading said. In a number of southern counties, where there are marshlands and other areas with brackish water, he sprays the herbicide to combat phragmites, although the spread of phragmites in the Passaic River Parkway required spraying in Berkeley Heights. “The idea is not to eradicate all invasives—it’s probably not even possible—but to give native species a fighting chance,” Schrading said. Before Schrading came in with his spraying equipment years ago, work crews went through the woods in Lenape Park cutting the Japanese Knotweed, which can grow upwards of 15 feet in height. The cutting not only weakens the plant, but makes it easier to apply the herbicide, which contains glyphosate, which only effects plant cells and presents no toxicity problems for insects or animals, he said. “At this time of year, plants are going into dormancy, so they draw the chemical down into the roots,” Schrading said. While there are varying theories as to how Japanese Knotweed was introduced to the Union-Essex area, it was initially thought of as an ornamental plant. In fact, the Olmsted landscape architectural firm, which designed the Union and Essex County park systems, along with Central Park in New York City and a myriad of other parks, included Japanese Knotweed in some of its planting designs. But no one knew then the consequence of their choice, Schrading said. Riding his quad through the park one recent afternoon, Schrading said he expected he could spray most of the Japanese Knotweed in about three hours. He would refill the 15-gallon tank two more times before he was done. It was a far cry from his first visit when he brought in Fish and Wildlife’s big guns, an amphibious tank-shaped vehicle called the “marsh master” equipped with a 100-gallon tank filled with herbicide. It took two days to spray everything, he said. Schrading estimates that in the treated area, the Japanese Knotweed was reduced by nearly 70 percent. Now much of the responsibility for holding the line will fall to the county, he said. Eric Schrading, an assistant supervisor with the U.S. 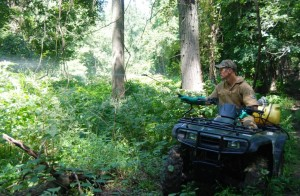 Fish and Wildlife Service, sprays herbicide on an outcropping of Japanese Knotweed in Union County’s Lenape Park. Not only do invasive species like Japanese Knotweed crowd out native plant species, but the monoculture that results reduces the diversity of wildlife that depend on the variety of other species of plant life to survive. 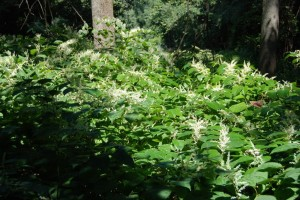 Spraying by the fish and wildlife service has reduced Japanese Knotweed in the targeted area of Lenape Park by nearly 70 percent. Japanese Knotweed, an invasive plant species that will take over and eliminate native plants, is a major problem in Union and Essex counties, where the U.S. Fish and Wildlife Service has been conducting spraying programs to bring it under control. The plant can grow upwards of 15 feet in height. 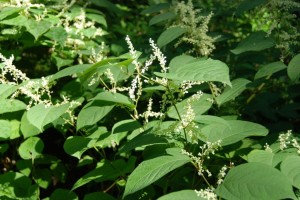 According to the National Parks Service, Japanese knotweed, which has its origins in East Asia, can be found from Maine to Wisconsin, south to Louisiana and in scattered locations in the Midwest and Western states. It can tolerate a variety of adverse conditions and is commonly found near water sources, such as along streams and rivers, in low-lying areas, waste places and utility rights-of-way and around old home sites. It spreads quickly to form dense thickets that exclude native vegetation and greatly alter natural ecosystems. Once established, it is extremely persistent. Eric Schrading, an assistant supervisor with the U.S. Fish and Wildlife Service, rides through Lenape Park looking for Japanese Knotweed. Once he finds and outcropping, he sprays it utilizing the herbicide carried in the tank on the back of his all terrain vehicle.